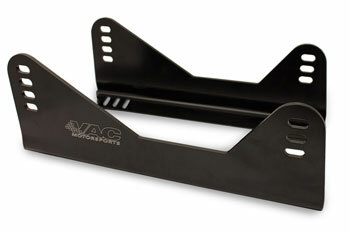 Although our VAC Superior Side Mount Brackets were originally designed to achieve a perfect fit and safety level with our VAC Floor Mount Adapters, they are also nearly universal for most seat brands, working with virtually any race seat on the market, as well as any mounting to most sliders. Whats so special about them? These brackets are contoured to help you get the best fitment in the tight floor pans of BMW's (or any other application that require a tight, clean install). By having the side-to-side slotted-adjustability of these mounts, we can not only ensure a personalized fitment, but also the ability to fit your seat of choice to a location that allows installation without hitting the B-pillar or center console. As for what really makes them Superior? They are shaped in an 90° "L pattern" vs the common "7" shape; making them narrower than most of the competition. This allows them to fit in vehicles with narrow floor pans or with wide transmission tunnels. Even seats that would normally be impossible to fit without heavy modification are now as easy as any other... They allow for fast and easy installation of nearly all popular seats including Racetech, Momo, Sparco, Recaro, Bride, OMP, Status Cobra, and many, many others. (RT1000 seats specifically need to use Racetech mounts). From years of experience with many brands, we have come to exclusively recommend our side mounts when installing seats with our floor mount adapters. Wider Slots in Mounting Flange to Accommodate Differing Seat Widths and Seating Preferences. Narrow Profile Design to Allow Race Seats to Be Moved Closer to Center Tunnel for better fit and weight distribution. Lightweight Yet Extremely Strong Aluminum construction Vs. Stamped Steel. ** Sold in matching set of L & R for (1) seat. Order (2) if supplying both passenger and driver. We typically recommend that the taller portion of the side mounts go to the front of the seat, this allows the seat to be tilted as much as needed. From Dean Robinson of Magnolia, Texas on 12/5/2015 . The only bracket that worked for me!! From Troy Velazquez of Salem, New Hampshire on 7/1/2015 . From Anonymous of Houston, Texas on 6/23/2015 . From Adam C of Levittown, Pennsylvania on 1/15/2015 . From Shane Gorski of Clinton Township, Michigan on 1/18/2013 . VAC Floor Mount Adapter for BMW E36/E46 – Just looking for floor mount adapters?